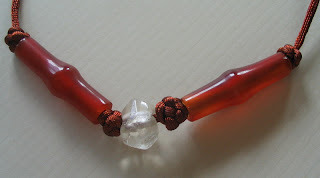 I composed and made this carnelian and rock crystal necklace using button knots. Making this necklace, provided dual benefits, as I could practice tying my knots and completing it means I can wear my favourite beads. 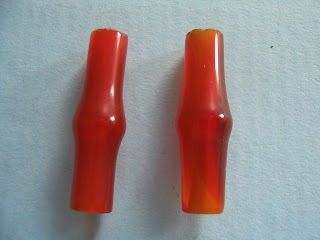 The carnelian cylinders were purchased from a Tibetan lady in China. She couldn't tell me the exact vintage nor origin. This shape is sometimes referred to as "bamboo " shape by the Chinese and sometimes "bulging at the waist " shape or "yao-gu-xing". I guess Westerners would say bi-conical. I have seen bamboo-shaped cylinder carnelian beads which have been provenanced to Western Zhou - Warring States (11-3rd century BC) in Chinese books, including Roger Chow's Sparkling Splendours, but I am not saying that my beads are ancient. Lest I be scoffed at for false/misleading comparisons, I must explain that I am not drawing these comparisons to imply that my cylinders are authentic of the Warring States era. I have not seen many examples of these cylinders in real life, nor in books, (ah, alas the narrowness of my experience) and so it was interesting for me to come across the illustrations given in the Chinese documents. No ulterior motive intended :) Besides there are many other considerations apart from a similar looking shape to justify a bead as old/ancient, let alone belong to the fabulous Warring States era ! And for all I know my beads maybe new beads, new beads made old, old beads made older, antique, vintange, plain replicas, and many other combinations. My specimen is in good condition and the stone if ancient is still shiny, the bead hole is rather large and the bamboo wedge shape is rounded, not sharp. Roger Chow's sample is sharp and so there's the difference. The walls of the bead are rather thin when compared to the size of the perforation. How did the tubes get so hollowed out ? Is this method of stone bead making peculiar to a period or culture? So the jury is still out on this pair of cylinder beads. And meanwhile they do pique my interest. 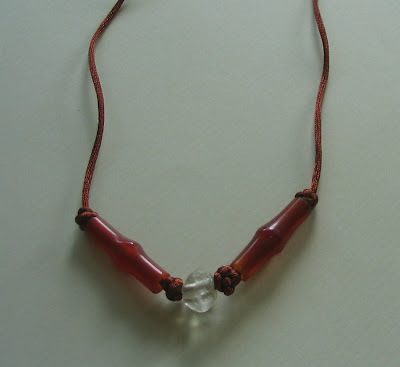 The central rock crystal bead is truncated, biconical, and faceted. It came from Myanmar and is likely to be Pyu about 100 BC to 840 AD or later.